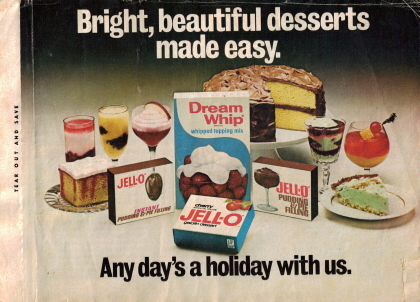 This vintage recipe booklet was distributed by General Foods in 1977 for the Jell-O and Dream Whip food brands. There are 16 delicious Jell-O desserts, all of them are available below. Just click a page title to view the recipes, there are pudding treats, cakes & cookies to drool over.